Interest in Simon Fraser University grew rapidly after the University opened its doors in 1965. To provide information to the public, SFU first relied upon the Executive Assistant to the President. This position was held for the first two semesters by R. J. Watts, an instructor in the English Department, and, in an acting capacity during the summer of 1966, by E. N. Turner, a graduate student from the same department. In August 1966 the University hired Dennis Roberts, an experienced newsman and public relations director as its first full-time information officer. Roberts wrote news releases, prepared brochures, began a speakers' bureau to address off-campus groups, and started a campus tour program. He was assisted by a secretary and student tour guides. Because there were no vice-presidents or other senior officers in those years, the Information Officer also acted as a special assistant to President Patrick McTaggart-Cowan. Roberts wrote many of his speeches, and McTaggart-Cowan even deputized Roberts as speaker at several meetings. With increased funding, the Information Office gradually expanded its scope. 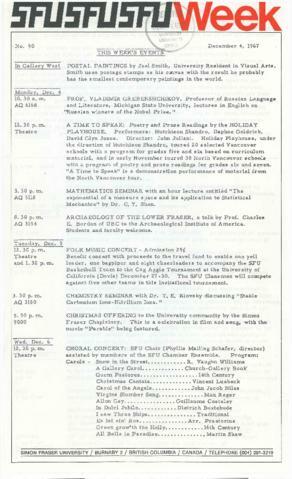 The Director hired an information assistant, and, in 1972, changed the name of the Information Office to University News Service to better describe its functions and to avoid confusion with the term "information systems." In addition to press releases, the University News Service produced SFU Week, Comment, and Takkali. Roberts also took on responsibility for the SFU Pipe and Drum Band for eight years. After he retired from SFU, the University made an arrangement with the Port Moody Pipe Band to perform as the University's band. In his spare time, Roberts produced SFU-oriented greeting cards and cartoons for faculty, students and staff. Roberts left the University in 1982 and was replaced by his long-time assistant Ken Mennell, who remained as Director until 1998. Mennell changed the name of the office to Media and Public Relations in 1988 to reflect the department's activities more accurately.